Workers at Foxconn Technology Group’s Shenzhen City, China, factory—which manufactures Apple products—are said to have stolen more than 200,000 certified Lightning headphone connectors valued at millions of yuan, according to Chinese tech news site Chongdiantou.com. Chongdiantou.com reported via an Aug. 9 post on Sina Weibo—a social-media platform similar to Twitter—that an insider working in the Apple accessories supply chain said that some workers at the factory stole Apple C100 and C101 Lightning MFi (“made for iPhone, iPod, iPad”) connectors for headphones. Foxconn was missing an entire pallet shipment of the goods, which would number about 200,000. 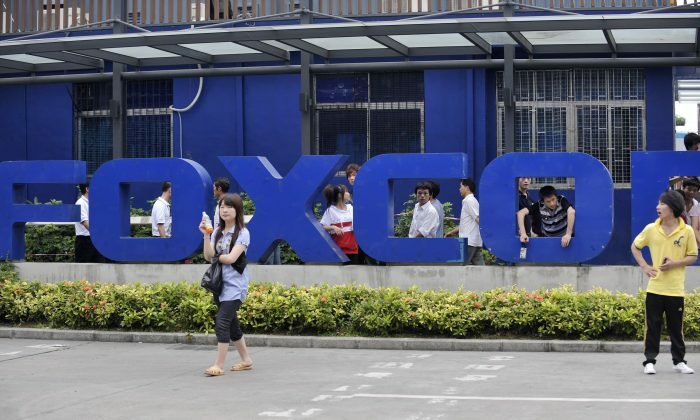 Several Foxconn workers have reportedly been arrested in connection with the theft. Each connector retails for about 40 to 45 yuan ($5.85 to $6.58), so the total value is estimated at 8 million to 9 million yuan ($1.2 to $1.3 million). The loss of goods caused a stir within the Chinese market. Meanwhile, Foxconn’s performance on the stock market has been faltering since being listed on the Shanghai Stock Exchange on June 8. Investors told Hong Kong newspaper South China Morning Post in July that they weren’t optimistic about the company’s ability to transform itself into a smart manufacturing hub from its role as a traditional assembler. As of the market closing of A shares on Aug. 8, Foxconn Industrial Internet fell 3.47 percent, closing at 15.01 yuan ($2.19) a share. Its total market value, meanwhile, fell to 295.6 billion yuan ($43.22 billion) on Aug. 8—from its peak value at 519.3 billion ($75.93 billion), representing a loss of about 223.7 billion yuan ($32.71 billion) in value. Foxconn, also named Hon Hai Precision Industry Co., is a multinational electronics contract manufacturing company, headquartered in Taipei, Taiwan. It opened its first manufacturing plant in China in the southern city of Shenzhen in 1988.